The private foundation established by the late Carl Gans is continuing his legacy in herpetology and biology through the dissemination of his works and offering grants to students within his fields of study. The fund has announced that it will support travel awards available to both graduate and undergraduate students who are attending any of three different meetings in 2016, two of which are herpetology focused, including the Joint Meeting of Ichthyologists and Herpetologists in New Orleans, LA (July 6-10) and also the World Congress of Herpetology in Hangzhou, China (August 15-21). All students are eligible for these awards regardless of nationality. Applications can only be submitted for a single conference (ex. you can not apply for funding to attend both JMIH and WCH). Applicants must present a paper (oral or poster) at the meeting within the broad spectrum of research conducted by Gans on the biology of reptiles and amphibians to be eligible. The application deadline for both awards is 15 March 2016. See here for more information and application instructions. 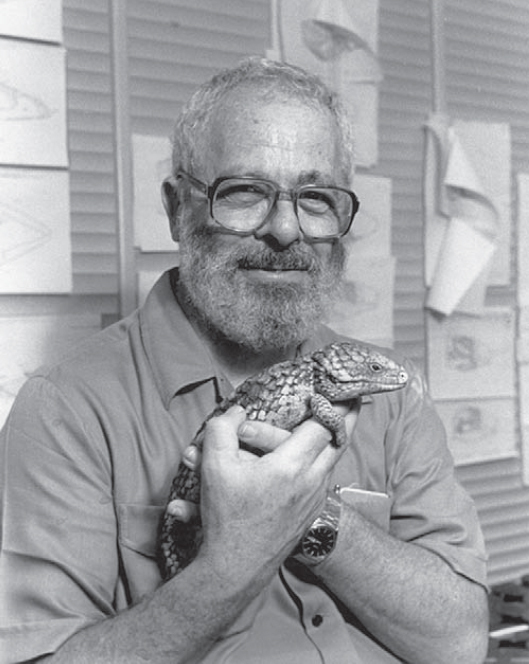 Professor Gans was considered one of the preeminent specialists on the biology of reptiles and made contributions to their systematics, comparative and functional morphology, physiology, biomechanics, and behavior in over 600 publications. The fund consists of a Board of Trustees led by Leo Gans, Dr. Ronald Gans, and Eva Lynn Gans, and a Scientific Advisory Board, which is under the direction of Drs. Kraig Adler, Aaron Bauer, Amos Bouskila, Herb Rosenberg, and Linda Trueb. The Gans Collections and Charitable Fund has recently published Gans’ Biology of the Reptilia series online, freely available at carlgans.org. The series consists of 22 volumes and approximately 14,000 pages, covering the morphology, behavior, development, ecology, neurology, and physiology of reptiles. The webpage provides the complete table of contents and index of the series, as well as direct access to the full content of every volume. The Fund hopes that access to this valuable resource will enable and inspire further study in these fields. The 8th World Congress of Herpetology will take place August 15th to 21st 2016 in Hangzhou, China. For more information please visit the website dedicated to this years meeting or view the most recent announcement. There will also be substantial support for students to attend this years meeting. Herpetology students from around the world are invited to apply for the WCH8 Student Support Schemes. Up to 48 scholarships are available for Full conference support (8) and Partial conference support (40). Scholarships are competitively based on academic merit; however priority will be given to students from under-represented countries. For more information on the awards please see the full announcement here. You can also visit the website of the World Congress of Herpetology. Start 2016 doing good for amphibian research! Two days left for several of these amphibian research campaigns at Instrumentl, a science crowd-funding site, where there are currently 19 projects to choose from. To mention just a few: research on the deadly salamander fungus (Bsal) to breeding ecology in Bhutan’s Amolops to educational outreach and innovative new field techniques with frog call monitorin by cell phone for the recently descirbed Rana kauffeldi. While you can this weekend, donate to your favorite worthy cause, amphibian research by all these passionate scientists! The abstract submission site is now open for the 2016 Joint Meeting of Ichthyologists and Herpetologists in New Orleans, LA held July 6th to 10th! The abstract submission form and instructions are available here. You will be required to register for the site. Once you have registered, you will get a reply with instructions on how to submit your abstract. Please read the instructions carefully, as there are some changes from last year. The abstract submission site will close on 18 March 2016. As has become more common at scientific conferences in recent years, there is now an option to give an oral “lightning” talk. These are 5 minute talks, 10 slides maximum, and no questions from the audience following the talk. These short form talks are ideal for presenting preliminary research or for putting out a call for data, feedback, or collaboration. We look forward to seeing everyone in NOLA! Help support SSAR for free!! Would you like to contribute to SSAR but don’t have the money to spare? If you use Amazon.com you can help give back to the society every time you make a purchase! Just use this link to go to Amazon Smile which will make a small contribution to an organization of your choosing every time you make a purchase. Simply click “Select” and you will be supporting SSAR every time you make a purchase from Amazon! Just make sure you use the Amazon Smile link every time you shop. Amazon will normally ask you if you want to go to Amazon Smile if you attempt to use the regular Amazon site after you have selected a charity. The Metallinou Fund – Take action now! Dr. Margarita Metallinou was a talented, up and coming evolutionary biologist and herpetologist who was tragically killed in July 2015 while doing fieldwork in Zambia. She had been scheduled to present her latest work at the SSAR meeting later that month at the University of Kansas. The suddenness of her loss has shaken the entire scientific community who lost a promising and gifted researcher as well as a vibrant role-model for aspiring female scientists. To commemorate her legacy, SSAR has launched an effort to establish a Postdoctoral Travel Award endowment in her name. This permanent endowment will allow post-PhD students from any part of the world to attend a scientific conference in the USA, as Margarita had planned to do. They will be able to present their research at the annual meeting of the world’s largest professional herpetological society and to confer with other scientists in their field. This exposure is essential to establishing a young scientist’s reputation and can often lead to other opportunities including employment. Read more about this campaign on Instrumentl. SSAR is a registered 501(c)3 organization and a letter documenting your donation for tax purposes may be requested by adding special instructions to your PayPal donation or by contacting us directly here. In addition, every issue five years old and older (currently 1967-2010) are fully open access. SSAR would like to thank Jeff Miller for kindly scanning all of the older issues of Herpetological Review, allowing the society to offer these as pdfs. Book Sale: SSAR is currently having a clearance sale on a large number of books. This sale ends September 30th, 2015. Orders can be placed online at: http://www.ssarbooks.com/ and all items on sale are listed under the “Clearance Sale” category. The following eight items will return to their suggested retail price after September 30th. Other titles may remain on sale, but at a higher price. Please consider stocking up on gifts or prizes. Books make a great “thank you” gift for students. Below is a grant announcement from Prairie Biotic Research, Inc. This Wisconsin based non-profit has funded hundreds of projects since 2002, including ones focusing on reptiles and amphibians. They will be offering at least 15 grants of $1000 in their 2016 grant cycle. For complete details please read below, or click here to download a PDF of the announcement. We Are Prairie Biotic Research (PBR) is an all-volunteer, Wisconsin nonprofit established in 2000 to foster basic biotic research in prairies and savannas. One way we do this is through a competitive Small Grants Program that funds grants up to $1000 to individuals for the study of any grassland taxon anywhere in the USA. We support both natural history and experimental science. We are especially eager to support independent researchers (those lacking institutional support), but anyone having a U.S. Social Security number may apply. Since 2002, we’ve awarded 211 grants worth $202,881 to people in 34 states to study insects, plants, mammals, reptiles, slime molds, mycorrhizal fungi, spiders, snails, amphibians, birds, fish, invasive species, effects of management, and the human dimensions of conservation. Many of these grants supported graduate student research. In 2016, we expect to fund at least 15 grants of up to $1000 each with the donations we have received, including some restricted by donors to support research in IA, IL, MI, MN, ND, SD, or WI. To Apply for a Grant Visit our newly redesigned website to learn more, to find our proposal form, instructions, and a sample researcher agreement form that winners of this competition must sign. Check out the history and overview files in the Small Grants section of the website to see what sorts of proposals have won funding in the past. Several winning proposals from past years are available as models on our website. Review the reports submitted by researchers of past years. Those who won funding in 2015 are ineligible for this funding in 2016, but those who won funding longer ago are welcome to submit proposals to further that same work or to support a new project. In past years, we required submission of hard copy proposals, but not any more. Beginning this year, we want you to submit your proposal electronically, as a pdf file attached to an email. We must receive your proposal via email by December 20, 2015. Become a Supporter Please make a donation to support our work; you can now do so using Visa or Mastercard through PayPal on our newly redesigned website. We cannot give away money that we don’t have. Any amount is welcome. PBR is volunteer-run so our overhead is very low. You may specify that your entire tax-deductible donation be given to researchers through our Small Grants Program, or to expand our research endowment that produces income we give away annually through this program. Please help us to help others! Michael Anderson, Craig Brabant, Rebecca Christoffel, Linda Duever, Jaime Edwards, Brick Fevold, Joshua Kapfer, Kerry Katovich, Douglas LeDoux, Victoria Nuzzo, Ron Priest, Dennis Schlicht, Steven Sullivan, Scott Swengel, Andrew Williams, Daniel Young, who comprise the Board of Directors and Scientific Advisors of Prairie Biotic Research, Inc.